This month, the last month of 2017 – and our final month of focus on gods, goddesses, and divine sources of energy at our full moon gatherings – brings us full circle as we approach the final frontier of sacred energetic work and seek wisdom in the shamanic realms. 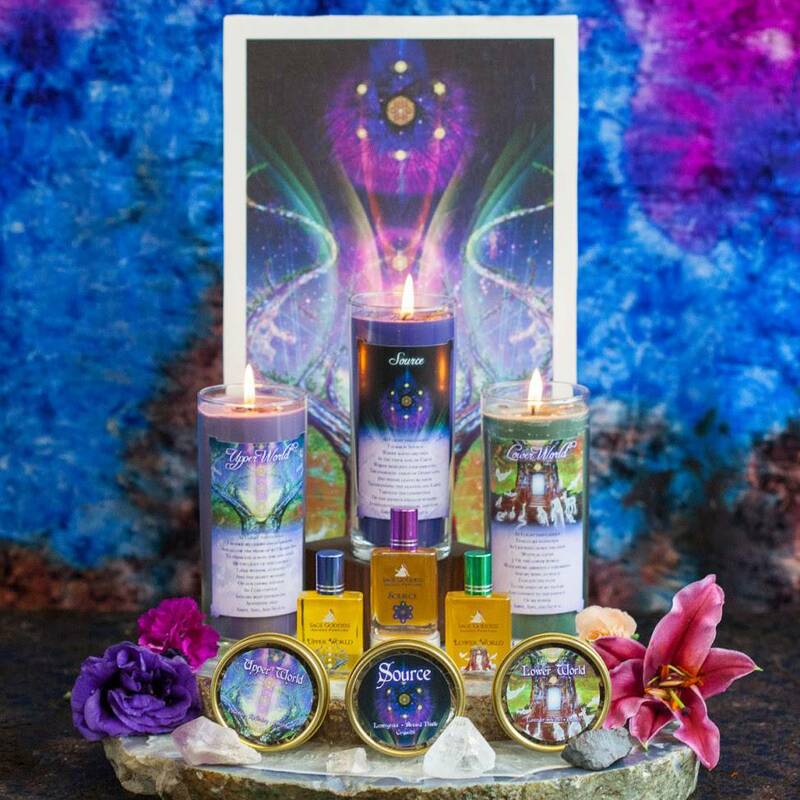 Your kits this month prepare you for a dual ritual at the December full moon, when we will journey together, first the Lower World – the realm of spiritual animal helpers and the crystal and mineral kingdom – and then the Upper World – the realm of spirit guides, ascended masters, and light beings from other galaxies. The centerpiece of this month’s tools is our Source kit, which represents the singular emanation of light from which all life emerged. However you think of God or Goddess, the One who breathed life into your being, is how you should work with this kit. It represents your own imagining of the Divine, your own ability to connect deeply with the fountain of energy at the center of our Cosmos. The One who made All. When we journey to the upper and lower worlds, we engage new sets of teachers and spirit helpers who can shepherd us through outer realms, assisting us as we see and interpret signs all around us. All beings and creatures are teachers to us, and unique entities reside in the different words. I did not create a kit for the Middle World, as that is where we live and breathe today. That is our local realm of human creation, the mortal coil of time and space. For our December work we will leave the Middle World together, exploring the Above and the Below as a means of gathering deeper answers to our most compelling questions, seeking the medicine of those best prepared to offer it to us. You are free to use these kits all year long, as you should! These are among the most multi-purpose kits I’ve brought to you this year. Keep your Source candle on your alter permanently, all year long, and if you’re in my Magical Sabbatical course, use your Upper World and Lower World candles when we do Elder Council together each quarter or anytime you engage in journeywork with me or with others in your life. My Source set comes with a Source candle (about 11.5 oz), hand-poured with a deep indigo soy wax blend. Your candle will also come with a custom blessing you can recite to invoke the cosmic energy of Source. Each candle is adorned with a clear quartz chip stone to further amplify its properties. 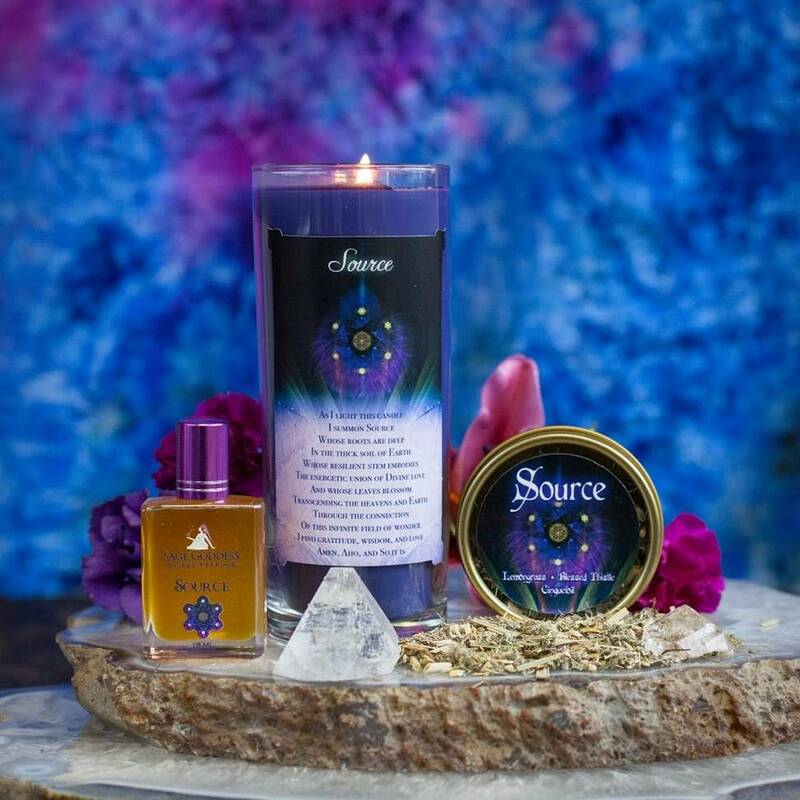 Then you will receive one 15 ml roller bottle of Source perfume with notes of myrrh, rose, and tuberose – Source is a luxurious blend with protective, healing, and transformative properties that will enhance your deep meditations while also keeping you grounded. 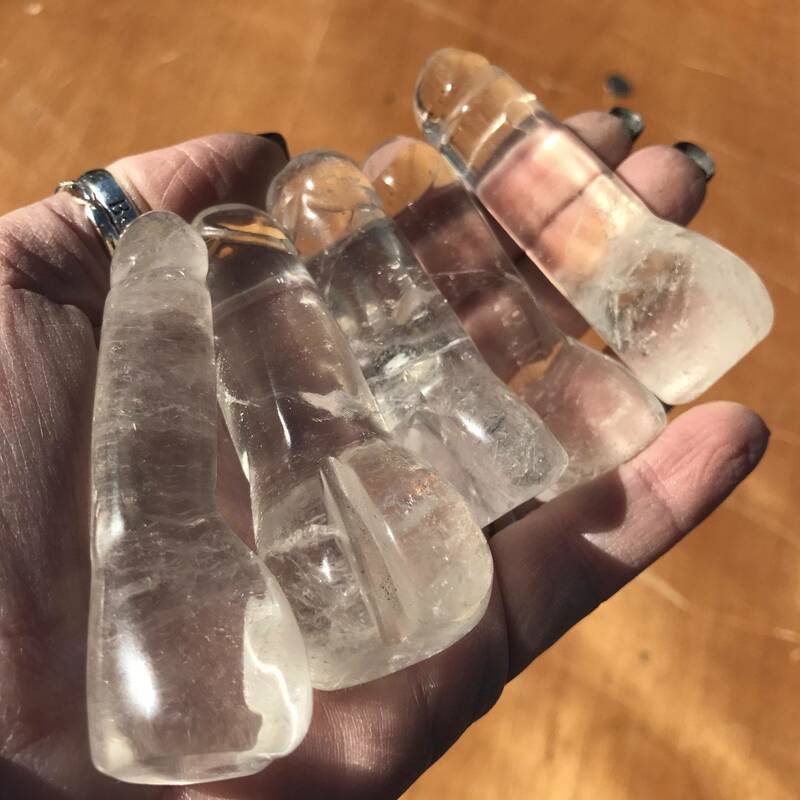 Each bottle comes infused with a clear quartz chip stone to further amplify its properties. 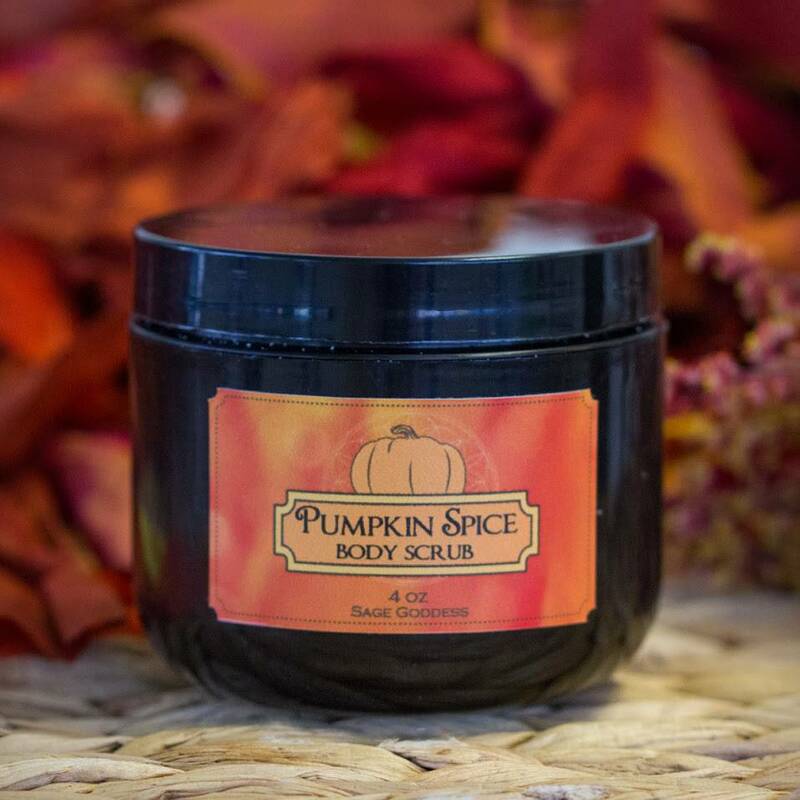 Next, you will receive the herbs of Source which include lemongrass, blessed Thistle, and cinquefoil. Lemongrass is known to ward off evil and bring luck in love, and is often used for divination and cleansing rituals. Blessed thistle is good for stimulating appetite and encourages healthy digestion. Cinquefoil is a do-it-all kind of herb. It summons love, prosperity, health, wisdom and power. It is sometimes known as five finger or five leaf grass and I like to burn this herb to add a layer of magic to intention setting. 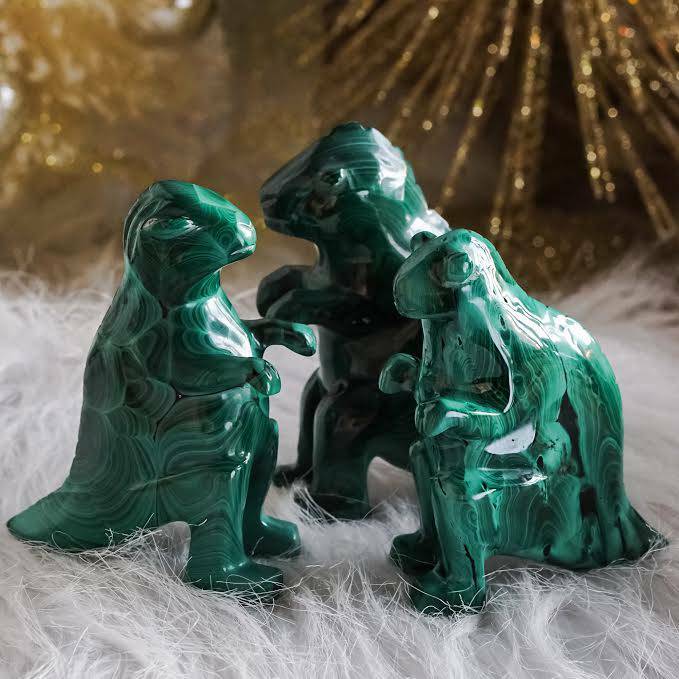 Lastly, you will receive the Source stone set which includes an apophyllite tip, a Herkimer diamond, AND a 16×8″ canvas artwork, custom made at Sage Goddess, with an image of the World Tree, representative of Source. My Upper World set comes with an Upper World candle (about 11.5 oz), hand-poured with a purple soy wax blend. Your candle will also come with a custom blessing you can recite to invoke you guardians and guides. Each candle is adorned with a amethyst chip stone to further amplify its properties. Then you will receive one 15 ml roller bottle of my Upper World perfume with notes of lily of the valley, angelica, and ylang ylang – a gentle, yet, highly protective blend with a sweet and sensual aroma – which aids in elevating you to greater heights of consciousness. Each bottle is infused with a blue goldstone chip stone to further amplify its properties. Next, you will receive the herbs of the Upper World which include lavender, violet, and jasmine. Lavender helps ease headaches, insomnia, and brings about a state of happiness. Lavender is also known for its powers in love, romance, sexual attraction and attraction of the beloved! Violets are flowers of peace and virtue, protection and affection. They bring sweetness and an echo of time gone by. Jasmine allows you to open your Third Eye and look deep within your subconscious. Lastly, you will receive the Upper World stone: a natural amethyst point, or Chevron Amethyst point. Amethyst is the stone of peace and divine clearing – the gem bearer of self-control, wisdom, and discernment. It promotes restful sleep, helps you maintain equilibrium during stressful periods, prevents nightmares, and counteracts both alcoholic and emotional drunkenness. My Lower World set comes with a Lower World candle (about 11.5 oz), hand-poured with a moss green soy wax blend. Your candle will also come with a custom blessing you can recite to travel to the depths of the lower world. Each candle is adorned with an obsidian chip stone to further amplify its properties. Then you will receive one 15 ml roller bottle of my Lower World perfume with notes of musk, patchouli, and frankincense – a deep, protective, and earthy blend that warms and uplifts the spirit. Each bottle is infused with an obsidian chipstone to further its properties. Next, you will receive the herbs of the Lower World which include patchouli, rosemary, and horehound. Patchouli is my favorite herb. It draws money and success, abundance and wealth, but also grounds you, connects you to the Earth, and calls you into present time. The smoke of rosemary is said to draw positive spirits and discourage the presence of any unwanted energy. Elders have burned rosemary for centuries to purify, heal, bless and consecrate. Legend has it that horehound, ‘seed of Horus’, was used as an antidote for poison, to break powerful black magic spells, and as an aid to priests during rituals. Lastly, you will receive the Lower World stone: natural hematite. Did you know that natural hematite is the main component of the core of our Earth? It is literally molten and glowing from within. Hematite is a Root Chakra stone of grounding, hope, trust, and surrender to the Universe. It roots us deeply in the Earth’s stability and balances the body, stabilizing our equilibrium and helping both ethereal and physical systems remain aligned. You have the option of ordering the complete Full Moon Ritual Set, which includes both Upper and Lower Worlds, and the complete Source Set, including the gorgeous canvas artwork -or if you wish you may order just the Source set by itself. Choose the offering you are called to from the drop down menu above. Yours will arrive lovingly parceled for your enjoyment and delight.